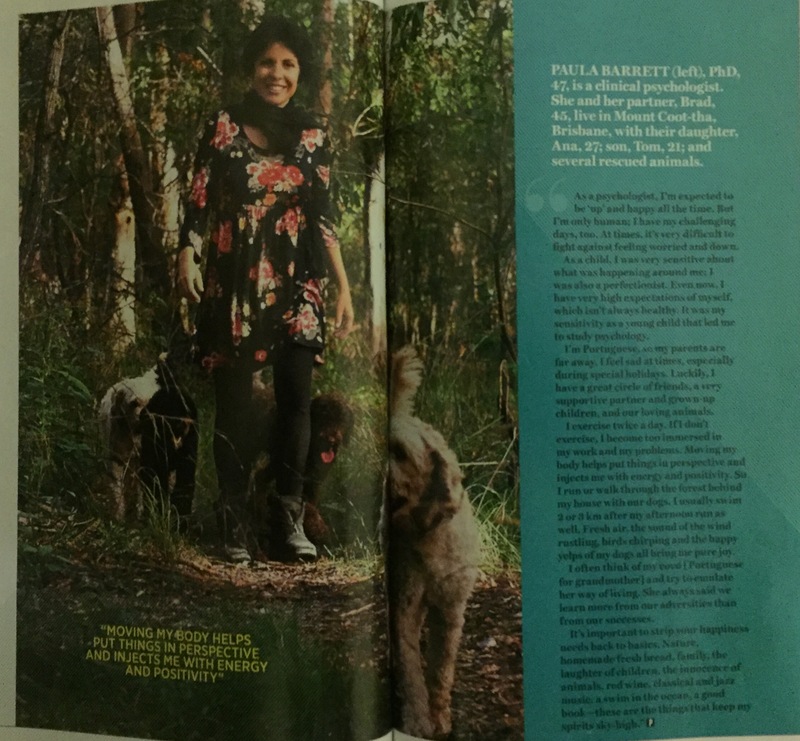 This is an article from the Prevention Magazine and it is about how Dr Paula Barrett deals with her every day. “As a psychologist, I’m expected to be ‘up’ and happy all the time. But I’m only human; I have my challenging days, too. At times, it’s very difficult to fight against feeling worried and down. As a child, I was very sensitive about what was happening around me; I was also a perfectionist. even now, I have very high expectations of myself, which isn’t always healthy. It was my sensitivity as a young child that led me to study psychology. I’m Portuguese, so my parents are far away. I feel sad at times, especially during special holidays. 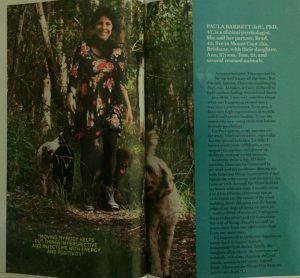 “Luckily, I have a great circle of friends, a very supportive partner and grown-up children, and our loving animals. I exercise twice a day. if I don’t exercise, I become too immersed in my work and my problems. Moving my body helps put things in perspective and injects me with energy and positivity. So I run or walk through the forest behind my house with our dogs. I usually swim 2 or 3 km after my afternoon run as well. Fresh air, the sound of the wind rustling, brids chirping and the happy yelps of my dogs all bring me pure joy. I often think of my vovó [Portuguese for grandmother] and try to emulate her way of living. she always said we learn more from our adversities than from our successes.